Bully: Scholarship Edition debuts on the Xbox 360, adding new content, next gen graphics, and two player mini-games that make this title appealing to previous Bully players and a whole new audience. 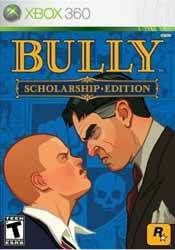 Bully: Scholarship Edition takes place in the fictional New England boarding school of Bullworth Academy and tells the story of 15-year-old Jimmy Hopkins as he experiences the highs and lows of adjusting to a new school. You stand up to bullies, get picked on by teachers, play pranks on malicious kids, win or lose the girl, and ultimately learn to navigate the obstacles of the fictitious Bullworth Academy. After Hours (20) Spend 5 hours out after curfew. Casanova (20) Receive 25 kisses from the ladies. Kickin’ the Balls (20) Kick 100 soccer balls. Dual Nebula (20) Achieve A High Score on Consumo, Nut Shots, and Monkey Fling Arcade Games. Soda-licious (20) Buy 100 sodas. Helping Hand (20) Complete 10 Errand Missions. Keener (20) Complete 3 Classes. It’s All in the Wrists (20) Complete All 4 of the Carnival Games once. Pole Position (20) Complete All Go Kart Races. Black & White & Read All Over (20) Complete All Paper Route Missions. Sophomore (20) Complete Chapter 2. Senior (20) Complete Chapter 4. Smart Mouth (25) Say 100 taunts. Skidmark (25) Give 50 wedgies. Momma’s Boy (25) Complete 30 Errand Missions. The Wheel Deal (25) Perform 200 wheelies on the bike. Tour De Bullworth (25) Travel 100 km on the bike. Graduate (40) Complete Chapter 5.